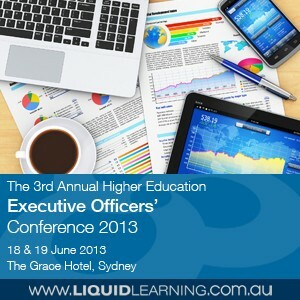 Liquid Learning is delighted to present the 3rd Annual Higher Education Executive Officers’ Conference 2013, the premier professional development and networking event for Higher Education Executive Officers. This conference will represent the chance to benchmark with successful Executive Officers in Higher Education, featuring a mix of case studies and expert commentaries. Follow this event on Twitter using the event hash tag #HEXO13 and @LiquidLearning for daily industry updates! Liquid Learning is delighted to present the 3rd Annual Higher Education Executive Officers’ Conference, building on the success of past events. Delegate feedback has been incorporated to enhance an already successful program. Addressing a variety of areas affecting Executive Officers’ in Higher Education, this year’s program will showcase how Executive Officers can position themselves better to address upcoming challenges and shifting expectations. This is the only professional development opportunity targeting the unique needs of Executive Officers in Higher Education. It recognises the unique challenges these professionals face and provides a unique opportunity for participants in similar roles to exchange ideas and experiences in a conducive and productive setting. This year’s event will offer a well-rounded approach consisting of practical case studies, interactive sessions and commentaries from leading experts. The program is designed to be interactive to allow delegates the opportunity to network and benchmark with leading current and former Executive Officers. The program is complemented by a facilitated Masterclass to improve communication, leadership and influencing skills. Email: marketing@liquidlearning.com.au or visit our website.